Fran's House of Ayurveda: Props for local vegan, wheat-free foodie! Props for local vegan, wheat-free foodie! One of my inspirations for delicious (and often indulgent!) healthy vegan and wheat-free and unrefined, naturally sweetened food is Ricki of Diet, Dessert and Dogs (her three passions). This month Ricki is having a contest where the grand prize is chocolate and baked goods home-made by her. Check it out on her blog. While you're there, see some of her amazing recipes, and her brand new cookbook! 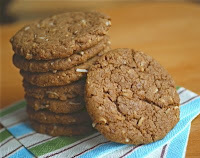 Pictured above are her ginger coconut cookies -- recipe on her website! Swami Vishnu-devananda was the first in the West to develop a training program for yoga teachers. He did this not only with the vision to develop yoga professionals, but also to give sincere aspirants the skills of personal discipline and to develop messengers of peace. The Course is a profound, personal experience, based on the ancient gurukula teaching system, integrating the student's daily life into the yoga training. By the end of the intensive four-week course the student will possess a firm foundation for teaching others, in addition to strengthening his or her own yoga practice with self-discipline and awareness of the nature of body, mind and spirit. Upon graduation from the course, students receive a certificate of qualification. The program has seen the graduation of more than eleven thousand students over the last thirty years. Men and women come from all around the world take part in the training, which is given in English with simultaneous translation into European languages, as well as Hebrew, Japanese, Hindi, Tamil and Malayalam. we developed a program that teaches you everything you need to know to teach yoga AND run a successful yoga business - and you can learn it from home, at your own pace. I call it the "Yoga Teacher Training Camp" for Home Study Yoga Teacher Certification. And with the praise I've received for the original camp-in-a-box, I've been inspired to create a full collection of home study courses for popular and important Yoga Teacher specialities, such as Restorative Yoga Teacher, Kid's Yoga Teacher, Chair Yoga Teacher, Pre-natal & Post-natal Yoga Teacher, Yoga Teacher Trainer (level II), Vinyasa Yoga, Meditation Teacher, Yoga Anatomy and more. Equally important, I've developed courses and tools to help Yoga Teachers run successful Yoga Teacher businesses. After all, it's one thing to devote yourself to doing what you love (Yoga), but it's quite another to be able to support yourself comfortably and securely while doing it. You won't learn these skills at a typical Yoga Teacher Camp. Whether you're an experienced Yoga Teacher needing to re-certify or a beginner looking to become a yoga teacher - you've come to the right place. Our Free Yoga Teacher Community will help you find what you're looking for. Read more about how and why I developed this program or visit our products page to learn more about the extraordinary value of these courses.